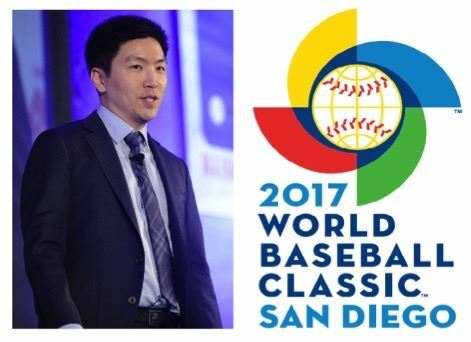 The San Diego World Affairs Council is pleased to announce a special event Saturday, March 18, with Major League Baseball’s Senior Vice President for Growth, Strategy & International, Chris Park. The event will be held at Procopio Tower, 20th Floor, 525 B Street, from 11:00 a.m.-12:30 p.m. A reception will follow. Mr. Park, who will be in San Diego for the Second Round of the World Baseball Classic, March 14-19 at Petco Park, will address MLB’s plans for continued global growth and the challenges of operating in such diverse overseas markets as Cuba, Venezuela, the Dominican Republic, Taiwan, South Korea and Japan, as well as relatively new countries for baseball such as Australia, China and the Netherlands. Join SDWAC for this timely discussion of the evolution of our national pastime into a truly international sport. After the talk, stay downtown to take in World Baseball Classic action at nearby Petco Park! Chris Park is responsible for overseeing all aspects of Baseball’s international business initiatives, including MLB’s global events, television, sponsorship, licensing, new market development and grassroots development in the sport’s nontraditional areas. He also plays a key role in the World Baseball Classic, the global tournament jointly operated by MLB and the Major League Baseball Players Association. A Harvard graduate, Mr. Park was honored with a “Forty Under 40” Award from the SportsBusiness Journal/Daily in 2012. For questions or more information, please email: sdwac@sdwac.org. The maximum capacity for this event is 50 people.